When the baton passed on to Ratan Tata from the late JRD Tata in 1991, most observers expected the House of Tatas to be rendered asunder by feuding satraps. Luckily for Ratan, the old man stuck around on the wings of Bombay House long enough to downsize the giants he created during half of century of corporate helmsmanship: Russi Modi (Tata Steel), Darbari Seth (Tata Chemicals), Ajit Kerkar (Taj Group of Hotels) and Sumant Moolgaokar (Telco). By the time JRD passed away in December 1993, it was clear that Ratan Tata’s vision for consolidating group companies under the Tata Sons banner had the patriarch’s stamp of approval. As India’s second round of economic liberalisation got underway, the Tatas’ holding company gradually increased its shareholding in group companies like Tisco (now Tata Steel), Telco (now Tata Motors), Tata Chemicals and Tata Tea. Of the very little information about Ratan Tata in the public domain, it is well known that he had a troubled childhood. Born on December 28, 1937, to Sonoo and Naval Hormusji Tata, Ratan underwent the trauma of his parents separating while he was very young. Ratan was brought up by his grandmother Lady Navajbai and he lived in South Mumbai. After his education at Campion School, Ratan Tata moved to Cornell University, USA, for a degree in architecture and structural engineering. He was all set to take up a job with IBM in 1962 when he returned home to be with his ailing grandmother. Lady Navajbai passed away soon after and Ratan Tata decided to stay on in the country. In true Tata fashion, Ratan Tata began his apprenticeship at the TISCO shopfloor in Jamshedpur before moving on to bigger things. There were little portents of the great things to come during Tata’s early career. 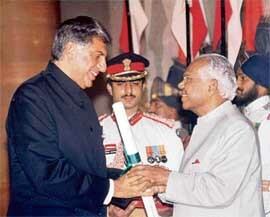 Ratan Tata receives the Padma Bhushan. The National Radio and Electronics Company Ltd (Nelco) where Ratan first cut his teeth as a manager in the early 1970s melted away when the first wave of colour televisions hit India in the 1980s. The next venture that Ratan shepherded, the Empress Mills, too turned out to be a debacle. To his dismay he discovered that Empress Mills were competing not just with other companies but with other mills in the Tata fold who were undercutting it in the marketplace. The textile strike led by Dr Datta Samant however proved to be the final nail in its coffin. That Empress Mills was the very first manufacturing facility set up by founder Jamsetji Tata in the early 19th century did not add to Ratan’s credibility as a manager. But with the backing of JRD, Ratan persevered notwithstanding the snide remarks against him in the media encouraged by rival chieftains in the Tata group. The brickbats continued when Ratan Tata decided to get out of the Fast Moving Consumer Goods business and concentrate on the group’s core competency-manufacturing. Lakme, the cosmetics manufacturer, and Tata Oil Mills Company which made soap were hived off to Hindustan Lever Ltd-the latter for just Rs 420 crore. Ratan Tata continued to receive bad press when Tata Motors under his chairmanship decided to get into the passenger car business. For much of the 1990s, the markets hammered the Tata Motors scrip as sceptics doubted the viability of the small (Indica) car project. Ratan Tata’s biggest gamble on domestic soil would however be the people’s car priced at around Rs 1 lakh each. “We believe it will be extremely attractive to the Indian consumer — particularly the younger families — at a price level of about Rs 1 lakh,”Tata said in a letter to shareholders of Tata Motors last year. According to the Tatas the car to be launched in early 2008 will be rear-engined, four-door, four-five seater powered by a 30 brake horse power (BHP) engine. The design of the car is a closely guarded secret though Tata officials say its prototype is at the testing stage. Unlike conventional cars which have a metal body, Tata’s car will be based on moulded plastics built from cutting-edge technology. The plastics are being sourced from General Electric which assigned a team of 50 technologists to work on the plastics. The car will roll out sometime next year from the plant at Singur. Ratan Tata’s decision to bid aggressively for Corus is part of a game plan to de-risk the group’s fortunes. From being solely linked to the success of the Indian economy, the Tata Group is looking at other destinations. Even troubled destinations like Sudan and Iran are on Tata’s radar. Days after the Corus deal, the Tatas received approval from the Iran government to set up a three million tonne steel project with an investment of over Rs 6,000 crore. The plant may be scaled up to produce five million tonnes of steel. Iran has allotted 500 hectares in the Persian Gulf Special Economic Zone (PGSEZ) at Bandar Abbas for the gas-based steel plant, according to reports. Ore for the project will be sourced from Iran itself. Ratan Tata’s plans for Tata Steel aims to increase the company’s capacity to 100 million tonnes around the world by 2015. The Tata Group’s international foray comes amidst a few setbacks. An ambitious programme to invest $3 billion in Bangladesh for constructing a power plant, steel mill and fertiliser factory is now in cold storage. With that country in the middle of a difficult election campaign, the project has been shelved, at least for the moment. The turning point came in the late 1990s when the Indica hit the roads and the popularity charts for its price-value proposition. Simultaneously, the cost-cutting exercise at Tata Steel began to show results and the company emerged as the lowest cost producer of steel in the world. By the time Ratan Tata launched Tata Steel’s bid for Corus a year ago, the Cornell-trained architect had long secured some of the jewels in his crown against hostile takeover bids. With the Tatas growing from Rs 13,000 crore group in 1993 to Rs 1.5 lakh crore following the acquisition of Corus, all eyes are now on the reclusive Ratan Tata. The US-educated bachelor lives alone with his two German Shepherds in an apartment in downtown Mumbai. He is known to slip into the front seat alongside his driver to and from work. Known to guard his privacy jealously, Ratan Tata has been spotted at Parsi fire temples on festival days. He is known to be a supporter of the traditional Parsi way of life and is believed to have funded the religious education of community youngsters. However Tata’s publicists do not comment on this aspect of his life and the only bits of information trickle out from community members. With the spotlight on Tata, a few of his friends like painter Laxman Shreshtha have been forthcoming on their association with the industrialist. Shreshta told a city newspaper about Tata’s passion for home-cooked food and his hobby as an art collector. Along the way, the trained pilot who still takes to the skies on his own aircraft, has picked up a number of awards like the Padma Bhushan and Forbes Asia’s Businessman of the Year award.